At Mozilla, one of our very first automation systems was a performance testing framework we dubbed Talos. Talos had been faithfully maintained without substantial modification since its inception in 2007, even though many of the original assumptions and design decisions behind Talos were lost as ownership of the tool changed hands. In the summer of 2011, we finally began to look askance at the noise and the variation in the Talos numbers, and we began to wonder how we could make some small modification to the system to start improving it. We had no idea we were about to open Pandora’s Box. In this chapter, we will detail what we found as we peeled back layer after layer of this software, what problems we uncovered, and what steps we took to address them in hopes that you might learn from both our mistakes and our successes. Let’s unpack the different parts of Talos. At its heart, Talos is a simple test harness which creates a new Firefox profile, initializes the profile, calibrates the browser, runs a specified test, and finally reports a summary of the test results. The tests live inside the Talos repository and are one of two types: a single page which reports a single number (e.g., startup time via a web page’s onload handler) or a collection of pages that are cycled through to measure page load times. Internally, a Firefox extension is used to cycle the pages and collect information such as memory and page load time, to force garbage collection, and to test different browser modes. The original goal was to create as generic a harness as possible to allow the harness to perform all manner of testing and measure some collection of performance attributes as defined by the test itself. 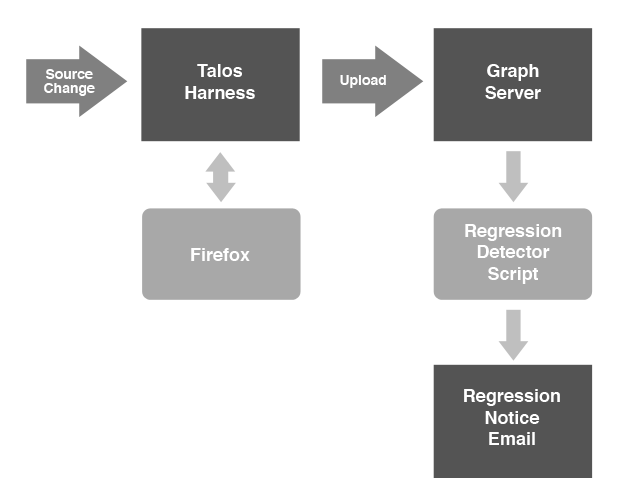 To report its data, the Talos harness can send JSON to Graph Server: an in-house graphing web application that accepts Talos data as long as that data meets a specific, predefined format for each test, value, platform, and configuration. Graph Server also serves as the interface for investigating trends and performance regressions. A local instance of a standard Apache web server serve the pages during a test run. The final component of Talos is the regression reporting tools. For every check-in to the Firefox repository, several Talos tests are run, these tests upload their data to Graph Server, and another script consumes the data from Graph Server and ascertains whether or not there has been a regression. If a regression is found (i.e., the script’s analysis indicates that the code checked in made performance on this test significantly worse), the script emails a message to a mailing list as well as to the individual that checked in the offending code. Noise–the script watching the incoming data flagged as many spikes in test noise as actual regressions and was impossible to trust. To determine a regression, the script compared each check-in to Firefox with the values for three check-ins prior and three afterward. This meant that the Talos results for your check-in might not be available for several hours. Graph Server had a hard requirement that all incoming data be tied to a previously defined platform, branch, test type, and configuration. This meant that adding new tests was difficult as it involved running a SQL statement against the database for each new test. The Talos harness itself was hard to run because it took its requirement to be generic a little too seriously–it had a “configure” step to generate a configuration script that it would then use to run the test in its next step. While hacking on the Talos harness in the summer of 2011 to add support for new platforms and tests, we encountered the results from Jan Larres’s master’s thesis, in which he investigated the large amounts of noise that appeared in the Talos tests. He analyzed various factors including hardware, the operating system, the file system, drivers, and Firefox that might influence the results of a Talos test. Building on that work, Stephen Lewchuk devoted his internship to trying to statistically reduce the noise we saw in those tests. Based on their work and interest, we began forming a plan to eliminate or reduce the noise in the Talos tests. We brought together harness hackers to work on the harness itself, web developers to update Graph Server, and statisticians to determine the optimal way to run each test to produce predictable results with minimal noise. When doing performance testing, it is important to have useful tests which provide value to the developers of the product and help customers to see how this product will perform under certain conditions. It is also important to have a repeatable environment so you can reproduce results as needed. But, what is most important is understanding what tests you have and what you measure from those tests. A few weeks into our project, we had all been learning more about the entire system and started experimenting with various parameters to run the tests differently. One recurring question was “what do the numbers mean?” This was not easily answered. Many of the tests had been around for years, with little to no documentation. Worse yet, it was not possible to produce the same results locally that were reported from an automated test run. It became evident that the harness itself performed calculations, (it would drop the highest value per page, then report the average for the rest of the cycles) and Graph Server did as well (drop the highest page value, then average the pages together). The end result was that no historical data existed that could provide much value, nor did anybody understand the tests we were running. We did have some knowledge about one particular test. We knew that this test took the top 100 websites snapshotted in time and loaded each page one at a time, repeating 10 times. Talos loaded the page, waited for the mozAfterPaint event, (a standard event which is fired when Firefox has painted the canvas for the webpage) and then recorded the time from loading the page to receiving this event. Looking at the 1000 data points produced from a single test run, there was no obvious pattern. Imagine boiling those 10,000 points down to a single number and tracking that number over time. What if we made CSS parsing faster, but image loading slower? How would we detect that? Would it be possible to see page 17 slow down if all 99 other pages remained the same? To showcase how the values were calculated in the original version of Talos, consider the following numbers. This final value would be graphed over time, and as you can see it generates an approximate value that is not good for anything more than a coarse evaluation of performance. Furthermore, if a regression is detected using a value like this, it would be extremely difficult to work backwards and see which pages caused the regression so that a developer could be directed to a specific issue to fix. We were determined to prove that we could reduce the noise in the data from this 100 page test. Since the test measured the time to load a page, we first needed to isolate the test from other influences in the system like caching. We changed the test to load the same page over and over again, rather than cycling between pages, so that load times were measured for a page that was mostly cached. While this approach is not indicative of how end users actually browse the web, it reduced some of the noise in the recorded data. Unfortunately, looking at only 10 data points for a given page was not a useful sample size. By varying our sample size and measuring the standard deviation of the page load values from many test runs, we determined that noise was reduced if we loaded a page at least 20 times. After much experimentation, this method found a sweet spot with 25 loads and ignoring the first 5 loads. In other words, by reviewing the standard deviation of the values of multiple page loads, we found that 95% of our noisy results occurred within the first five loads. Even though we do not use those first 5 data points, we do store them so that we can change our statistical calculations in the future if we wish. All data collected needs to be stored in the database, not just averages of averages. A test must collect at least 20 useful data points per test (in this case, per page). To avoid masking regressions in one page by improvements in another page, each page must be calculated independently. No more averaging values across pages. Each test that is run needs to have a developer who owns the test and documentation on what is being collected and why. At the end of a test, we must be able to detect a regression for any given page at the time of reporting the results. Applying these new requirements to the entire Talos system was the right thing to do, but with the ecosystem that had grown up around Talos it would be a major undertaking to switch to this new model. We had a decision to make as to whether we would refactor or rewrite the system. Given our research into what had to change on Talos, we knew we would be making some drastic changes. However, all historical changes to Talos at Mozilla had always suffered from a fear of “breaking the numbers.” The many pieces of Talos were constructed over the years by well-intentioned contributors whose additions made sense at the time, but without documentation or oversight into the direction of the tool chain, it had become a patchwork of code that was not easy to test, modify, or understand. Given our fear of the undocumented dark matter in the code base, combined with the issue that we would need to verify our new measurements against the old measurements, we began a refactoring effort to modify Talos and Graph Server in place. However, it was quickly evident that without a massive re-architecture of the database schema, The Graph Server system would never be able to ingest the full set of raw data from the performance tests. Additionally, we had no clean way to apply our newly-researched statistical methods into Graph Server’s backend. Therefore, we decided to rewrite Graph Server from scratch, creating a project called Datazilla. This was not a decision made lightly, as other open source projects had forked the Graph Server code base for their own performance automation. On the Talos harness side of the equation, we also did a prototype from scratch. We even had a working prototype that ran a simple test and was about 2000 lines of code lighter. While we rewrote Graph Server from scratch, we were worried about moving ahead with our new Talos test runner prototype. Our fear was that we might lose the ability to run the numbers “the old way” so that we could compare the new approach with the old. So, we abandoned our prototype and modified the Talos harness itself piecemeal to transform it into a data generator while leaving the existing pieces that performed averages to upload to the old Graph Server system. This was a singularly bad decision. We should have built a separate harness and then compared the new harness with the old one. Trying to support the original flow of data and the new method for measuring data for each page proved to be difficult. On the positive side, it forced us to restructure much of the code internal to the framework and to streamline quite a few things. But, we had to do all this piecemeal on a running piece of automation, which caused us several headaches in our continuous integration rigs. It would have been far better to develop both Talos the framework and Datazilla its reporting system in parallel from scratch, leaving all of the old code behind. Especially when it came to staging, it would have been far easier to stage the new system without attempting to wire in the generation of development data for the upcoming Datazilla system in running automation. We had thought it was necessary to do this so that we could generate test data with real builds and real load to ensure that our design would scale properly. In the end, that build data was not worth the complexity of modifying a production system. If we had known at the time that we were embarking on a year long project instead of our projected six month project, we would have rewritten Talos and the results framework from scratch. Being an open source project, we need to embrace the ideas and criticisms from other individuals and projects. There is no director of development saying how things will work. In order to get the most information possible and make the right decision, it was a requirement to pull in many people from many different teams. The project started off with two developers on the Talos framework, two on Datazilla/Graph Server, and two statisticians on loan from our metrics team. We opened up this project to our volunteers from the beginning and pulled in many fresh faces to Mozilla as well as others who used Graph Server and some Talos tests for their own projects. As we worked together, slowly understanding what permutations of test runs would give us less noisy results, we reached out to include several Mozilla developers in the project. Our first meetings with them were understandably rocky, due to the large changes we were proposing to make. The mystery of “Talos” was making this a hard sell for many developers who cared a lot about performance. The important message that took a while to settle in was why rewriting large components of the system was a good idea, and why we couldn’t simply “fix it in place.” The most common feedback was to make a few small changes to the existing system, but everyone making that suggestion had no idea how the underlying system worked. We gave many presentations, invited many people to our meetings, held special one-off meetings, blogged, posted, tweeted, etc. We did everything we could to get the word out. Because the only thing more horrible than doing all this work to create a better system would be to do all the work and have no one use it. It has been a year since our first review of the Talos noise problem. Developers are looking forward to what we are releasing. The Talos framework has been refactored so that it has a clear internal structure and so that it can simultaneously report to Datazilla and the old Graph Server. We have verified that Datazilla can handle the scale of data we are throwing at it (1 TB of data per six months) and have vetted our metrics for calculation results. Most excitingly, we have found a way to deliver a regression/improvement analysis in real time on a per-change basis to the Mozilla trees, which is a big win for developers. Talos collects 25 data points for each page. All of those numbers are uploaded to Datazilla. Finally, if the results are within our tolerance, Datazilla runs the results through an exponential smoothing algorithm to generate a new trend line.3 If the results are not within our tolerance, they do not form a new trend line and the page is marked as a failure. We determine overall pass/fail metrics based on the percentage of pages passing. 95% passing is a “pass”. The results come back to the Talos harness in real time, and Talos can then report to the build script whether or not there is a performance regression. All of this takes place with 10-20 Talos runs completing every minute (hence the 1 TB of data) while updating the calculations and stored statistics at the same time. Taking this from a working solution to replacing the existing solution requires running both systems side by side for a full release of Firefox. This process ensures that we look at all regressions reported by the original Graph Server and make sure they are real and reported by Datazilla as well. Since Datazilla reports on a per-page basis instead of at the test suite level, there will be some necessary acclimation to the new UI and way we report regressions. Looking back, it would have been faster to have replaced the old Talos harness up front. By refactoring it, however, Mozilla brought many new contributors into the Talos project. Refactoring has also forced us to understand the tests better, which has translated into fixing a lot of broken tests and turning off tests with little to no value. So, when considering whether to rewrite or refactor, total time expended is not the only metric to review. In the last year, we dug into every part of performance testing automation at Mozilla. We have analyzed the test harness, the reporting tools, and the statistical soundness of the results that were being generated. Over the course of that year, we used what we learned to make the Talos framework easier to maintain, easier to run, simpler to set up, easier to test experimental patches with, and less error prone. We have created Datazilla as an extensible system for storing and retrieving all of our performance metrics from Talos and any future performance automation. We have rebooted our performance statistical analysis and created statistically viable, per-push regression/improvement detection. We have made all of these systems easier to use and more open so that any contributor anywhere can take a look at our code and even experiment with new methods of statistical analysis on our performance data. Our constant commitment to reviewing the data again and again at each milestone of the project and our willingness to throw out data that proved inconclusive or invalid helped us retain our focus as we drove this gigantic project forward. Bringing in people from across teams at Mozilla as well as many new volunteers helped lend the effort validity and also helped to establish a resurgence in performance monitoring and data analysis across several areas of Mozilla’s efforts, resulting in an even more data-driven, performance-focused culture.